Week eleven of our Summer Fantasy Movie League is in the can and it was the sort of week that people long for, one where a film or two exceeds expectation allowing for a big score relative to the pack… if you make the right picks. Last week when I was finishing up the week ten post I felt that Slender Man was the wild card for the week. It was based on what is now a well known meme, horror movies always surprise me, generally doing much better than I expect, it didn’t have much competition on the horror front, and the box office projections for it were all over the map, running from $9 million to $25 million. All of that seemed to indicate that it could do well… or not… which pretty much defines a wild card. For my Monday Hot Takes league picks though I was not willing to risk it. I went conservative, running with 3x Mission: Impossible, 2x The Equalizer 2, and 3x Teen Titans GO! for my pick. The other possible wild card was Spike Lee’s BlacKkKlansman, for which there was no long range forecast and no projections on Monday night when I was writing and doing my first round of picks. It was priced by FML with the expectation that it could run to about $5-6 million, about half of what they seemed to be calling for Slender Man. And then there was The Meg, which didn’t seem like much of a wild card at all. Its long range forecast numbers had been sinking week after week, so that by Monday night it seemed like a toss-up as to whether it would out-perform Mission: Impossible, the latter going into its third weekend. And I could see why projections for The Meg might be modest. While not running with a statistically valid sample size, nobody I asked knew what The Meg was about. I had to look it up myself on Monday night to get the brief on it. And when I did read up on it, I wasn’t all that impressed by the idea of another shark movie in a world where the Sharknado series, set to release the sixth and promised last installment in the franchise, seemed to have sucked all the oxygen out of the shark tank. I mean, I love me some Jason Statham, but I wasn’t sure he was going to be enough to carry The Meg very far given my perceived obstacles. So I did my Monday night picks and felt I needed to keep an eye on Slender Man to see if it was going to hit the high end of expectations or not. That was the anchor to which I was expecting I might swap. The movie news sites seem to be past their summer box office obsession now that the blockbusters have passed as well. It wasn’t until Wednesday that Box Office Pro showed up with some forecasts, and they only deigned to call a top five rather than the ten they were doing earlier in the season. But in that top five there was BlacKkKlansman estimated at $12 million, ahead of Slender Man, which was only in for $10 million in their estimate. If true, that made the Spike Lee film very much under-priced and a very likely candidate for the best performer of the week. It was also clearly going to be the filler of choice, delivering the most box office for the buck. They were less enthusiastic about The Meg however, calling it at just shy of Mission: Impossible, the latter expected to top the week. So I swapped by lineup around, going with 2x Mission: Impossible, 5x BlacKkKlansman, and 1x Ant-Man and the Wasp. 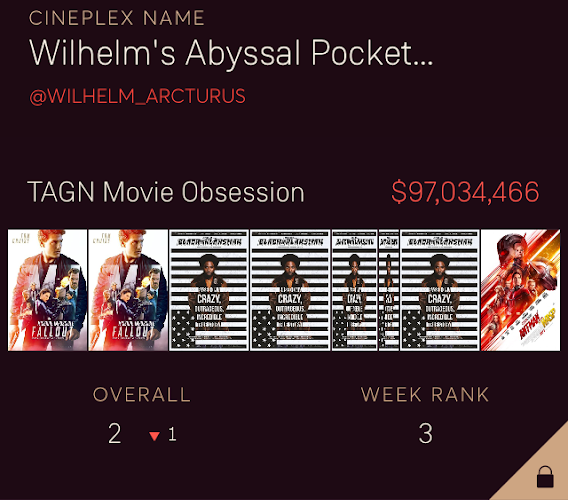 Box Office Pro tends to be a bit optimistic on its calls, so I felt that my other plan, 1x Mission: Impossible, 7x BlacKkKlansman might not be optimal for a league with no best performer bonus. However, that pick went to all my other leagues. That is where I left things until I saw the Thursday night preview estimates pop up on Twitter. Actually, I only saw one estimate before lock time for all of the other leagues, the estimate for The Meg, which was $4 million. That seemed like a lot. There is always the question as to how much one should value the Thursday night previews, with talk of multipliers between 5x and 8x depending on a range of factors. But I was thinking that if Mission: Impossible did $6 million in its preview and topped $60 million, then The Meg was most certainly going to get well past the meager $20 million forecasts. And so, minutes before the final lock, I swapped all my still unlocked leagues to 1x The Meg and 7x BlacKkKlansman. And then, of course, The Meg did $45 million for the weekend, more than double Mission: Impossible. Warner Bros. did a last minute social media campaign that helped lift it past modest projections. The Meg was the way to go, with the optimum pick for the league being 2x The Meg, 3x BlacKkKlansman, 1x The Incredibles 2, 1x The Darkest Minds, and an empty screen! Only ten people got their picks in for the week, which I think is a new low. Ah well. Corr won the week, with Goat and I tied for second with the same pick. The tables were turned from last week, when Corr and I different in lineup only on the main anchor. I chose right that time, going with Mission: Impossible over Christopher Robin. This time he got the anchor right. Meanwhile Po, who went with The Meg as anchor as well, was pulled down by betting heavily on the under-performing Dog Days. which was in seventh spot for pricing but ended up in twelfth for box office. Slender Man, while about spot-on for the price, was not a good option in the face of two over performing titles. So much for my wildcard theory. I am going to have to go back and note, for the final season scores, how many weeks people missed. The cut to make the list this week was $600 million. Next week I think it will be $700 million. Last week I was $10 million ahead of Corr. This week he is now $13 million ahead of me. Again, we can see how quickly that close of a lead can change, though it does require the leader to make a mistake, so I am depending on Corr to blow it if I am to have a chance. This week sees Jurassic World, Teen Titans GO!, and The Darkest Minds fall off the list. Coming in we have Crazy Rich Asians, Mile 22, and Alpha. Crazy Rich Asians, another comdey-drama, this time set at a rich wedding in Singapore. It leads the pack in pricing this week, though only by a hair. The last long range forecast has it running at about $15 million for the week, though it has been trending up. Either somebody thinks it is going to do significantly better than that or they think that The Meg, priced two dollars less, is going to drop precipitously from its $45 million week eleven opening. In addition, Crazy Rich Asians opens today, so there will be no Thursday night previews to pile onto the weekend total, but we’ll be able to see how it does on its opening night before the league closes. Mile 22 is Marky Mark back as an action hero. There is also John Malkovich in it as well. Mark Wahlberg always strikes me as a stand-in for a real action hero, like he is somebody you go with when your first choice isn’t available. But that might just be me. Anyway, this is supposed to be the launch of a new action franchise, if the film does well. Long range forecasts had it at $18 million for the weekend, which I guess either means that such forecasts aren’t really worth mentioning or that the people who do FML pricing have better sources than I do (most likely the latter), because it looks like somebody thinks it will only do 83% of what Crazy Rich Asians will make over the weekend. And then there is Alpha, a prehistoric tale of a boy and his dog. Seriously. It is about an ice age hunter who befriends a wolf. Early estimates put it in for around $7-10 million. That puts it awkwardly in the crowded high end filler section. Which leaves me trying to decipher the FML late summer pricing strategy. 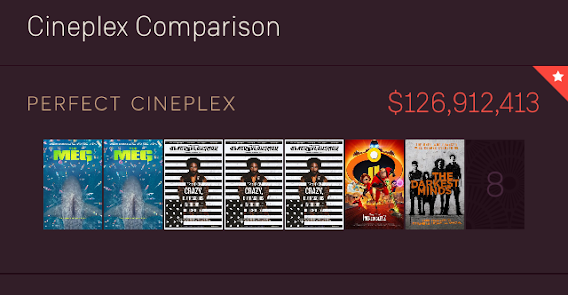 Last week FML got it badly wrong on two films, and while they have given BlacKkKlansman the usual over-perfomers pricing punishment I cannot figure out the plan for The Meg. But now it is Wednesday morning and the league is going to lock in less than 24 hours so be sure to go and make your picks. This entry was posted in entertainment, Fantasy Movie League, Movies and tagged Summer Fantasy Movie League on August 15, 2018 by Wilhelm Arcturus. I was on vacation – and I totally forgot about it but logged in like 10 minutes AFTER the cutoff. Was hearbroken. Ah well, c’est la vie. Definitely wasn’t intentional!